This is our version of a spectacular diced tomato fine chopped gourmet salsa. The combination of fresh tomatoes, onions, garlic, jalapeno peppers, tomato paste, sugar assure the very best and addicting taste this product provides. 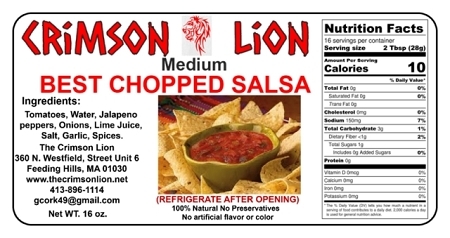 We often sell out at shows with our Best Chopped Salsa. This is considered to be our "old reliable' and is what salsa is supposed to taste like. It has a light/medium level of heat. My dad loves to add Best Chopped Salsa to his omelet.